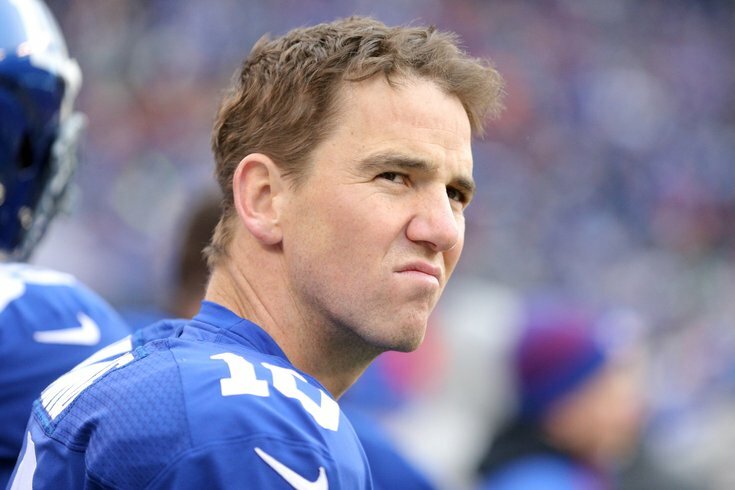 Soak up all the Eli faces you can, while you still can. Eli Manning is old now. He turned 38 years old this calendar year, and he’s been playing quarterback for the Giants since 2004. He’s faced the Eagles 32 times between the regular season and postseason; 16 of those matchups happened in Philadelphia. Manning’s first visit as a member of the Giants came Sept. 12, 2004, in his rookie debut, and his most recent visit came this past November. This all helps set the scene for Manning discussing his career Wednesday in a wide-ranging question-and-answer session. One thing that sticks out from 15 years of football? Nine-year-old children in Philadelphia flipping him off, which he said has happened throughout his career’s worth of trips to the Stadium Complex. This reads like an endorsement of the city’s oft-embattled school system. Children in Philly are so far ahead of an Ole Miss-educated football player that they’re teaching him new vocabulary? That’s a good sign. So they also flip the bird now and then. That’s okay. The team's nickname, after all, is the Birds. This shows a city dedicated to tradition, and focused on its youth. Philly respects its past and makes sure things live on for the following generations. Considering the city’s dedication to documenting its own history elsewhere, this is also a good sign. Manning also said the hardest hit he’s taken in his career to date came from former Eagle defender Jerome McDougle, in that first game back in September of 2004. “Fifteen seasons later I have not taken a bigger hit,” Manning said. He's right: that sure is a good hit. So, to recap, Manning thinks Philly breeds well-educated children who respect and uphold society’s vaunted traditions, and also football players capable of destroying young quarterbacks. Sounds about right.